The deep steaming by our expert supplier produces a gorgeous green liquid from the first brew of this fine tea. The complex taste is a combination of very slight astringency and subtle sweetness, which remains as the aftertaste. This extraordinary Japanese green tea is very refreshing. The second brew transforms the liquid into an interesting and very mild earthiness. The Sae Midori cultivar produces exemplary green tea leaves perfectly suited for Shincha. First Infusion: Add 1 gram of tea per 100 ml of fresh water, or about one tablespoon per potful. Heat the water to 80C (180F) and brew for one minute. Second Infusion: Brew with the same temperature water as the first infusion but for only a few seconds. Please note that the caffeine content of green tea becomes significantly less after the first steeping. Notes: We brewed the tea as suggested above in our taste tests in order to write the product description. We recommend that you experiment with your own techniques to find your most desired taste profile. For a healthy and invigorating refreshment in hot weather chill the liquid in your refrigerator/freezer to the desired temperature or pour over ice. Our products may be kept in your refrigerator before the package is opened. After opening the package, seal and store it in a cool dry place out of direct sunlight. Please do not place an opened package back into your refrigerator. 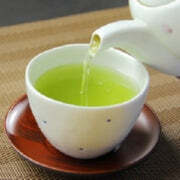 During processing deep steamed green tea is steamed approximately one minute longer than regular Japanese green tea. This sounds like a simple procedure, but actually it takes great skill and knowledge, such that most tea companies in Japan are unable to do it. Deep steaming causes tea leaves to lose their "leaf" shape and become separated. That makes this tea appear more powdery than others. When brewed, it often results in the thick-rich and dark green color liquid. The wet tea leaves may look mushy. Please do not be deceived by this appearance. 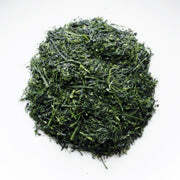 Shincha is packaged in limited quantities only once per year immediately after the spring harvest. It holds a special place in the hearts and palates of the Japanese people who enjoy drinking quality tea.